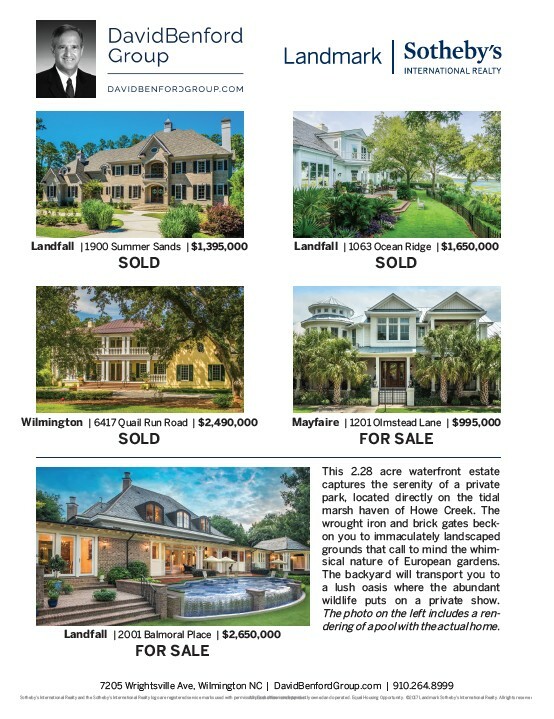 Landfall | 1063 Ocean Ridge | $1,650,000 SOLD Mayfaire | 1201 Olmstead Lane | $995,000 Mayfaire | 1201 Olmstead Lane | $995,000 FOR SALE FOR SALE Landfall | 1900 Summer Sands | $1,395,000 SOLD Wilmington | 6417 Quail Run Road | $2,490,000 Wilmington | 6417 Quail Run Road | $2,490,000 SOLD SOLD Landfall | 2001 Balmoral Place | $2,650,000 Landfall | 2001 Balmoral Place | $2,650,000 FOR SALE FOR SALE Landfall | 1063 Ocean Ridge | $1,650,000 SOLD Landfall | 1900 Summer Sands | $1,395,000 SOLD This 2.28 acre waterfront estate captures the serenity of a private park, located directly on the tidal marsh haven of Howe Creek. The wrought iron and brick gates beck-on This 2.28 acre waterfront estate captures the serenity of a private park, located directly on the tidal marsh haven of Howe Creek. The wrought iron and brick gates beck-on you to immaculately landscaped you to immaculately landscaped grounds that call to mind the whim-sical grounds that call to mind the whim-sical nature of European gardens. nature of European gardens. The backyard will transport you to a lush oasis where the abundant wildlife puts on a private show. The photo on the left includes a ren-dering of a pool with the actual home. The backyard will transport you to a lush oasis where the abundant wildlife puts on a private show. The photo on the left includes a ren-dering of a pool with the actual home. 7205 Wrightsville Ave, Wilmington NC | DavidBenfordGroup.com | 910.264.8999 7205 Wrightsville Ave, Wilmington NC | DavidBenfordGroup.com | 910.264.8999 Sotheby’s International Realty and the Sotheby’s International Realty logo are registered service marks used with permissAiolnl p. Eriaccehs oshffoicwen is a irned leispte pnrdiceen.tly owned and operated. Equal Housing Opportunity. ©2017 Landmark Sotheby’s International Realty. All rights reserved. Sotheby’s International Realty and the Sotheby’s International Realty logo are registered service marks used with permissAiolnl p. Eriaccehs oshffoicwen is a irned leispte pnrdiceen.tly owned and operated. Equal Housing Opportunity. ©2017 Landmark Sotheby’s International Realty. All rights reserved.